1. The first generation of VR headsets in the 21st century was finally hitting the market. 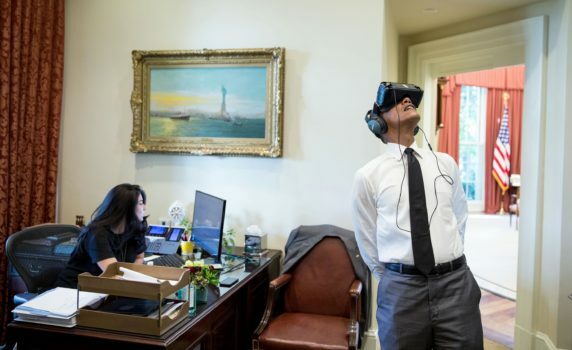 From Oculus Rift in on March 28, 2016. As stated by The Verge, Oculus Rift is finally complete with the release of Oculus Touch on December 6, 2016. HTC Vive, a VR headset developed by HTC and Valve Corporation, released on April 5, 2016. Even the most anticipated VR headset, PlayStation VR, also launched on October 13, 2016. On November 10, 2016, Google took mobile VR to the whole new level with the launch of Daydream, which only works with specific mobile phones. In addition, these VR headsets generally received positive reviews by technology news and media network, such as Tech Radar, Wired and Wareable. See also: Which VR Headset Should I SERIOUSLY Buy? 2. Through January 2016, over 5 million Cardboard viewers had shipped. And, over 1,000 compatible applications had been published. 3. Samsung Gear VR tops 1 million monthly activate users. With over 250 apps available. 4. The world’s first VR social network is also coming in 2016. Meet vTime. It allows you to meet your friends in a virtual world, anywhere, anytime. And, it’s available on Oculus, Samsung Gear VR, Google Play, App Store and Daydream. In my personal opinion, apps like vTime is the VR killer apps, as this is what we all need—meet our families and friends from wherever we are, no more driving, no more traffic. Just put your VR headset on, and hello, friends. 5. Two billion dollars investment. With the year only halfway done, the investment in 2016 already sees 85% growth over 2015′s funding total. Some of the investments in 2016 are Mindmaze ($100M), Blippar ($54M), WEVR ($25M). Shopping VR experience will also be the VR killer apps/system in the near future. Remember when you buy a t-shirt online, but it doesn’t look like in the picture? That probably won’t happen anymore with virtual reality, as you feel like coming to the store—well, you do come to the store, virtual store. 7. Top brands gone VR. From Time Inc to Fox Sports—they now have their VR apps available on Play Store and App Store. 8. Your favorite games also gone VR. 9. Your favorite movies, too. Or , Rogue One: A Star Wars Story. In 2016, a new way of selfie was found by Allie Go. Give it years, and the trend of 360 selfies will be everywhere as it is today. Remember those pictures on Instagram which shows a back of a woman, with her hand outstreched behind her, leading a guy’s hand? With Allie Go, you can see the guy’s face as well. 11. The first man in the U.S. tried VR twice. The first one was at the Hannover Messe trade fair. The second one at his office with Gear VR. 12. Google Earth gone VR—Google Earth VR, and it’s breathtaking. Imagine you can fly around the world from your home? Say hi to Google Earth VR. In a traditional Google Earth, you will see the maps and pictures in front of the monitor—but now there’s no separation. You’re inside. This could be the all-time favorite VR app. Plus, the trailer is just breathtaking. 13. You can start painting in a virtual world—and your painting automatically turns into a 3D art. Thanks to Tilt Brush by Google. 14. The first VR YouTuber, NathieVR, reaches 100,000 subscribers—and counting. Nathie shows you the magic of VR by recording his experience and uploading it on his channel. He mostly use HTC Vive, Oculus Rift (and Touch), and PSVR on his channel. He also did some giveaway, like this HTC Vive Giveway—which was sadly already closed. After spending eight months of researching, developing, and testing, our VR product called BeThere Book, is now available in some big stores in Saudi Arabia, such as Jarir Bookstore. BeThere Book is when a book meets virtual reality. It’s a ready-to-use virtual reality viewer with available contents provided inside. 16. There must be more than 16 VR trends in 2016, so share yours! In your personal opinion, what is the best things ever happened in VR in 2016?